The intensives are an explosive dive into Double Edge's training process. We’ll work daily from morning until night, both in Double Edge's indoor training spaces and outside in the fields, hills, pond and pastures of the Farm. 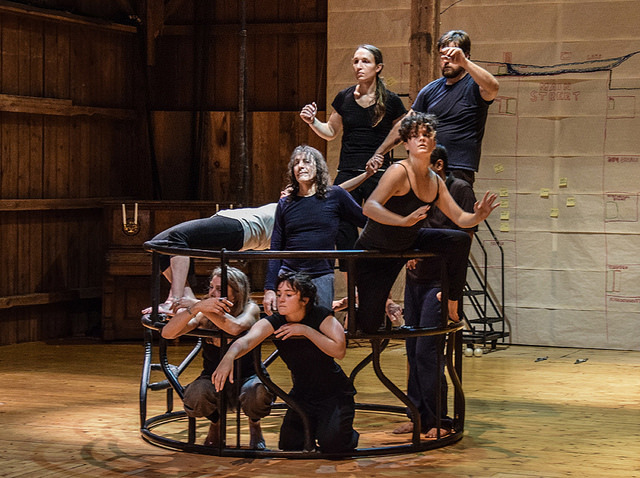 Layering our physical training practice with music, design, dramaturgy, large object work and individual and group research, intensives are a full-body experience of our multidisciplinary creative process. We explore the dialogue between individual process and group training and creation. The intensives are open to participants of all levels of experience and are ideal for pushing the boundaries of your physicality, creativity, and imagination! CLICK HERE to see a photo album from the 2017 Summer Intensive.